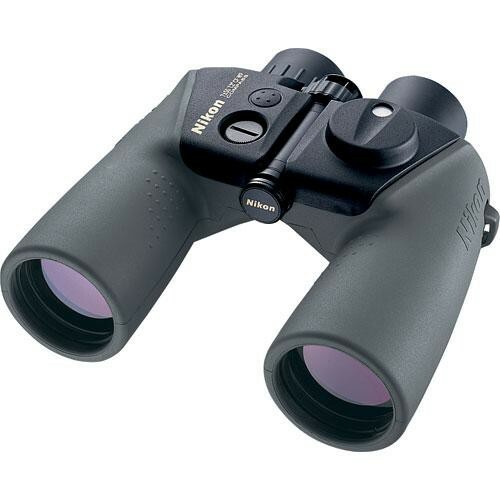 The 7x50 OceanPro Binocular with Compass from Nikon is a weather-sealed optic equally suited for use at sea or on land. This Marine series binocular features a nitrogen-filled fogproof housing wrapped in a slip-resistant rubber armor that enhances handling when conditions turn wet or while wearing gloves. In the event that your binocular accidentally goes for a swim, the floating neck strap included with OceanPro glasses can prevent your optic from sinking before it can be rescued. An integrated analog compass and rangefinder reticle enables the viewer to estimate their heading in addition to the size of or distance to objects within their field of view. The compass dial is auto-illuminated to enhance visibility; the inverted-T rangefinder has hash marks at 5 mil increments on both axes. In addition to the user-friendly handling and weather-resistant housing, the OceanPro binocular also has a fully multicoated optical path as well as a generous 23mm eye relief that allows a comfortable viewing distance even for viewers wearing eyeglasses. A 1/4"-20 threaded mount also allows this marine binocular to be tripod mounted for stability and improved long-duration observations.